Alcoholic patients are predisposed to many dangerous conditions and present an array of management challenges for emergency providers, however at many centers, some of these patients present with uncomplicated alcohol intoxication and end up admitted for alcohol withdrawal. This serves no one’s interests because alcohol withdrawal is a condition that generally does not benefit from inpatient management; detoxification proceeds over several days and the patient is discharged, unfortunately often to resume drinking, no better off than before. Though some alcoholics present in advanced withdrawal, requiring aggressive management and an ICU or step-down bed, many (most?) patients admitted for alcohol withdrawal present to the ED intoxicated and develop withdrawal in the department. Admitting this group is at best pointless and usually avoidable. There’s a lot of literature and discussion around treating alcohol withdrawal, but very little on how to prevent it, which perhaps is part of the problem. The first step is to identify patients at risk for withdrawal. The most obvious risk factor is a history of alcohol withdrawal, especially prior admission for alcohol withdrawal; ideally these patients would be flagged at triage. Anyone who drinks every day is at risk, though. Most at-risk patients arrive to the ED drunk, but if a daily drinker presents not drunk (i.e. comes with some other concern) or is in early withdrawal, promptly dose librium and reassess. 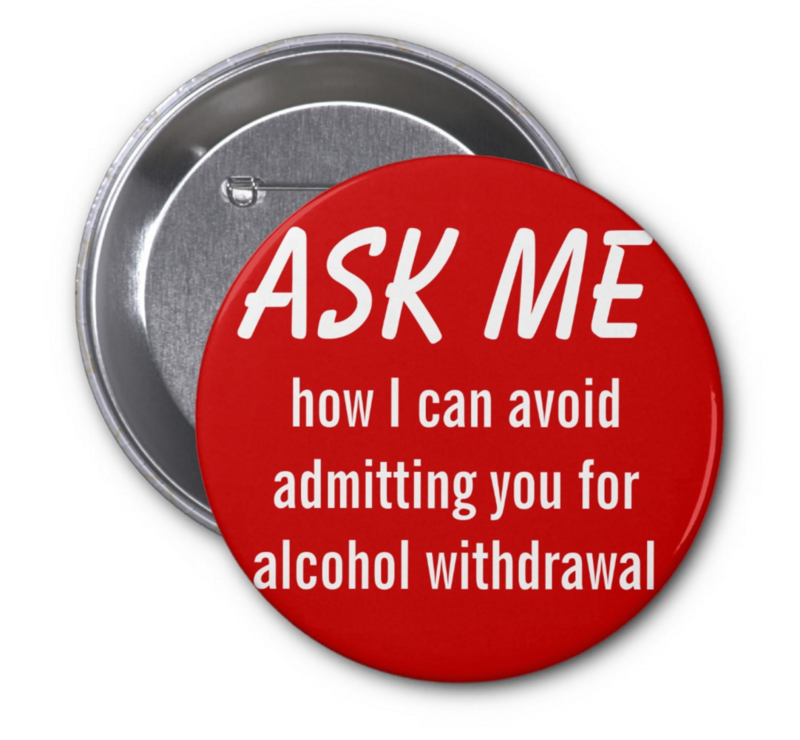 Intoxicated alcoholics at risk for withdrawal should be reassessed frequently for alertness. Once the sobering alcoholic is alert he is at risk for withdrawal and the most pressing concern is whether he can be safely discharged. If yes, discharge. * If he cannot be discharged for whatever reason (requires sutures, psychiatry, social work, an xray, etc. ), dose librium and reassess (and re-dose) every hour or two, until he can be discharged or needs to be admitted for some other reason. Librium dosing. 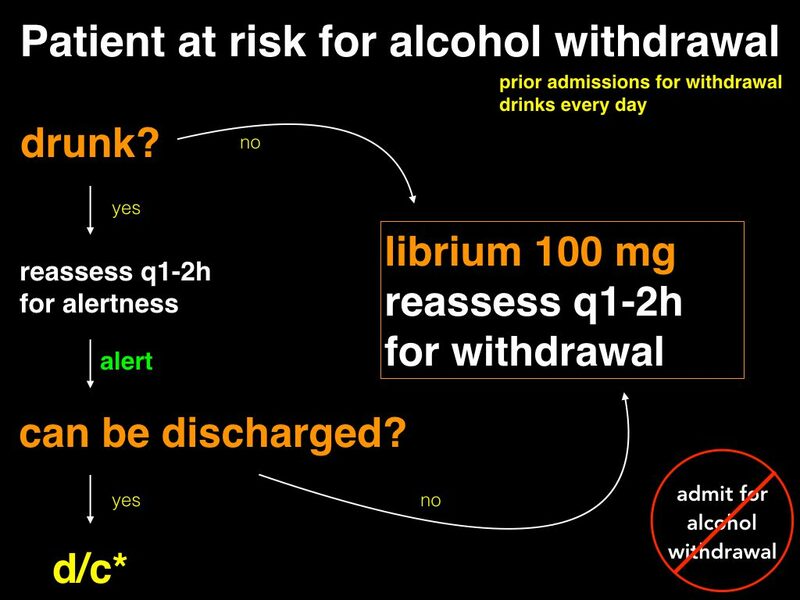 I see librium dosed at 25 or 50 mg, which works as part of a taper in mild withdrawal, but is often inadequate in the severe alcoholic whose last drink was 8 hours ago. You can succeed with small doses if you’re able to keep a very close eye and redose frequently as needed, but in most busy ED’s, you’re better off with a bigger dose, which will give you more time to circle back to reassess. For patients at risk to withdraw but without signs/symptoms, I use 100 mg. If early withdrawal has already developed, I write for 200 mg, yes that’s eight tabs, thank your nurse for making sure you meant it. 200 mg is outside the guidelines, but oral chlordiazepoxide is very safe; I have used this dose on hundreds of patients without running into trouble with respiratory depression or excessive somnolence. Caveat 1: Many alcoholics suffer with a host of comorbid medical, psychiatric, and substance problems beyond alcohol dependence. If these problems can be even partially addressed in a sustainable way during an inpatient stay, that admission is of benefit, even if the patient goes right back to drinking. My impression is that severe alcoholism so completely dominates the patient’s function that their accompanying problems cannot be meaningfully addressed unless and until the patient stops drinking. I am aware of no way to move severe alcoholics to sobriety other than high-intensity case management; if your hospital can set this up during an inpatient stay, by all means, admit. *Caveat 2: An at-risk inebriate who sobers in the ED and is discharged must of course be able to acquire alcohol to avoid withdrawal. Though alcoholics are astonishingly capable of accomplishing this regardless of circumstance, it may not be safe to discharge a brittle alcoholic at the cusp of withdrawal at 4am. Have an honest conversation with him, if he won’t be able to get booze for a few hours, dose librium and observe for a few hours. Thanks to Lewis Nelson and Anand Swaminathan for their insights.